Lisa Greif earned the fall 2018 Staff Recognition Award. Recent awards and honors were earned by SNR staff and students: Lisa Greif, sales associate for Nebraska Maps and More Store; and Diane Lally, environmental studies doctoral student and teaching assistant. 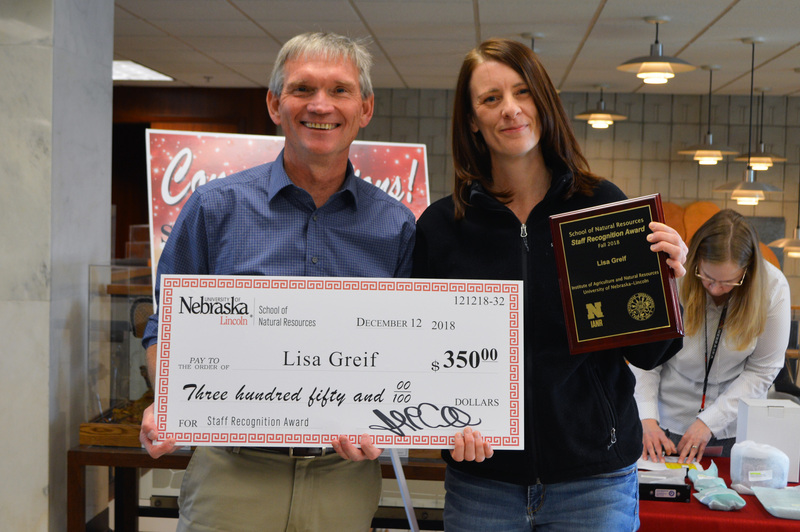 Lisa Greif, sales associate for the Nebraska Maps and More Store in the School of Natural Resources, earned the fall 2018 SNR Staff Recognition Award. She was presented with the award at the SNR Get Together in late December. As a sale associate, Greif helps order products for the store, which includes everything from books to toys, and arranges the floor. She in an integral part of both the store and the school’s daily operations. The SNR Staff Advisory and Professional Development Committee (SAPDC) is charged with coordinating the SNR Staff Recognition Award. The awards are presented once in the fall and once in the spring. The recipient receives a plaque and $350 stipend. Diane Lally, environmental studies doctoral student and teaching assistant; has earned a National Association of Geoscience Teachers Outstanding Teaching Assistant Award. The award honors undergraduate and graduate students who have demonstrated excellence as Teaching Assistants. Lally was nominated by Dr. Cory Forbes, science literacy professor at SNR, for her work in the undergraduate course Science Literacy 109: Water in Society. NAGT recognizes outstanding teaching assistants in geoscience education with up to 30 awards annually. Both undergraduate and graduate teaching assistants are eligible, and winners receive a one-year membership to the organization that includes an online subscription to the Journal of Geoscience Education and their quarterly magazine. Lally was one of five to earn the award in 2019.